What if we told you that there is now a way to replicate eggs and that you can have scrambled eggs, mayonnaise and all of those protein enriched foods without actually having to consume eggs. And all of that at a much lower price. Welcome to the 21st century. A San Francisco-based startup, Hampton Creek has introduced the world to this breakthrough idea of replicating eggs with plants. 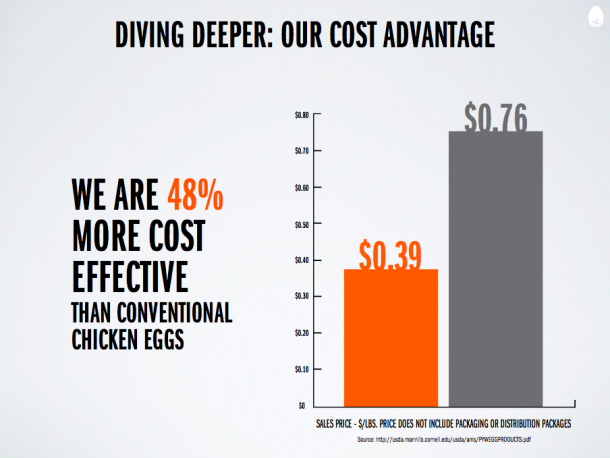 Hampton Creek CEO Josh Tetrick states that his product is 48% cheaper than our regular chicken eggs. He further added that although this does not mean that people should stop consuming eggs but his startup highlights the fact that this model of intensive agriculture is crazy and has no place in the current age of technological advancements. But it certainly means that the conventional chicken egg products will now become more or less obsolete. 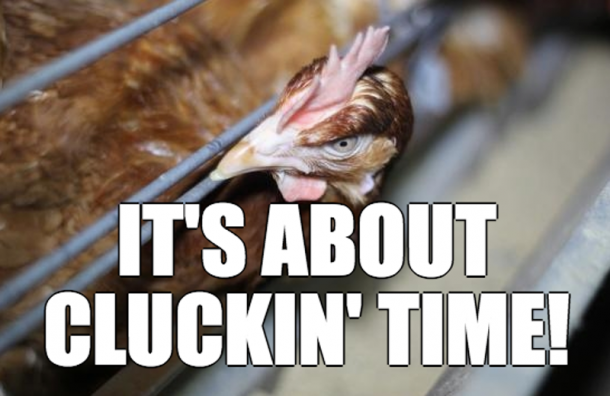 Because there is no structure for the egg providers to fight this battle unless science comes up with a way to not feed the chickens and still have things going, which is unlikely. There is no argument about how promising this startup seems. Investors know that and they are buying in. Hampton Creek received a funding worth $23 million led by Asia’s richest man Li Ka-Shing’s Horizon Ventures, in February. After receiving funding from other investors including Vinod Kholsa, Bill Gates, Peter Thiel’s Founder fund and Yahoo founder Jerry Yang, the total went up to $29.2 million. 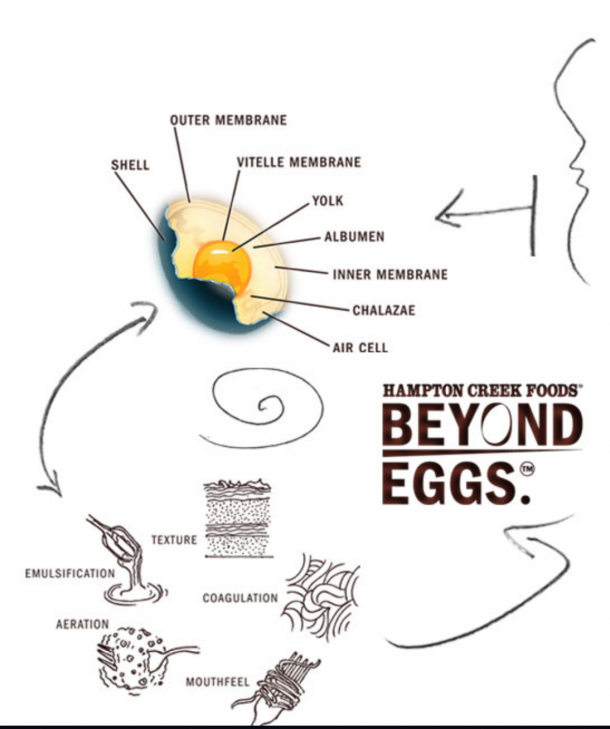 How did Hampton Creek reach this point of making history? Tetrick hired a team of scientists from around the world whose job is to break down or disintegrate plant specimens to find biological structures that can provide the exact same nutritional benefits as eggs do. “We’ve got lots of people from all over the world. They abandoned jobs paying $300,000 for this,” Tetrick says. After having examined over 3000 different plant specimens, and analyzing the molecular structure of each, the search ended up in a narrowed list of 11 plants that can help in making food products. At present, the major selling product by Hampton Creek is a substitute for mayonnaise which they call “Just Mayo” which is being used commercially at some Whole Foods stores for chicken. The company sees the product being used by fast food companies as a substitute for real mayo in the near future because as Tetrick claims, “We’ve tested it and it’s hard to tell the difference between Just Mayo and the real thing.” The company is currently working on another product which would be a substitute for cookie dough to be baked into cookies or even eaten raw. But the company’s primary focus at the moment is a product called “Just Scramble”, which as the name suggests would be a substitute for our conventional scrambled eggs. According to the company’s representatives, Just Scramble is close to perfection and just needs an adjustment in flavor. Just Scramble is made from seeds of a well known and consumed crop whose name is kept confidential. The seeds are ground and mixed with powder to create a paste after which centrifugal motion is used to separate the desirable proteins from other plant materials. After removal of impurities, the proteins are turned back into liquid form by a confidential process and can be cooked just like an egg. 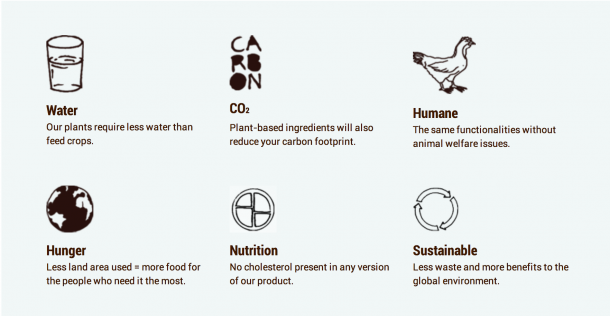 For Hampton Creek it’s not just about the taste, it’s about the nutritional content as well. 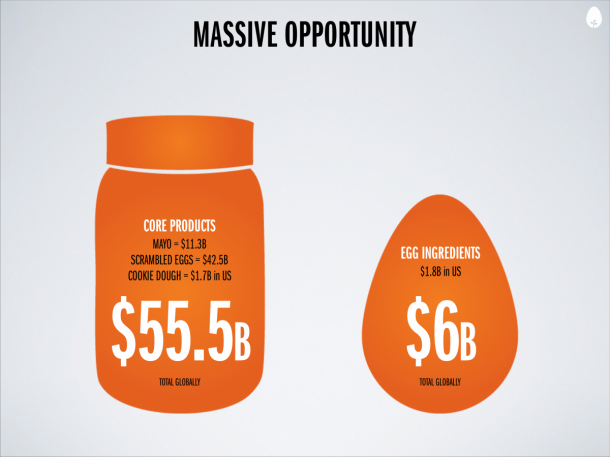 The company’s products have higher protein content than the conventional egg-based products. “For whatever reason, our society has gotten stuck on this notion of animal protein as the paradigm by which we do things,” Tetrick said. 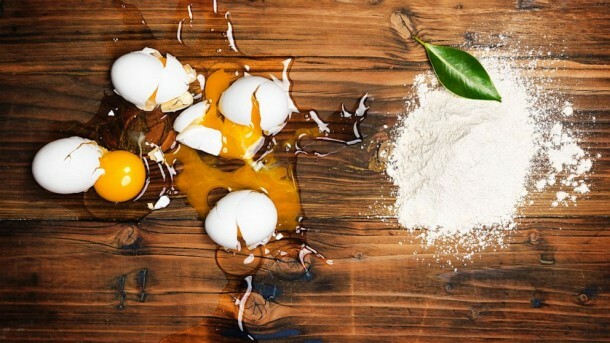 What attracts the technology investors to invest in the food industry is the fact that besides all of the other benefits of these products, they are a great degree more hygienic than conventional egg products. This is because as Tetrick pointed out, only a few batches of the eggs available to the consumers originate from free-range, fairly treated chickens. The rest, however, come from chickens in unsanitary cages. Hampton’s founder is vegan himself and his main goal is to give people a mainstream, low-cost, high-quality product that would attract people who want good food. We just might be looking at the turning point of food industry all together owing to the promise this company shows in its products.